This is “The Lady clothed with the sun”, who will “crush the head of the serpent”, Mary Immaculate. Bernadette did not understand what Our Lady was saying to her, and had to repeat these strange words to herself over and over in her Gascon dialect (“Que soi era Immaculada Concepcion”) all the way back to the parish priest, Fr. Dominique Peyramale, for fear of forgetting them! Only later was the meaning explained to her, and she realised that her ‘Lady’ was indeed The Virgin Mary, Mother of God. Our Lady gave Sister Catharine the miraculous medal, which was at first called: “the medal of Mary of The Immaculate Conception”, and told to spread the devotion. How sure are you that this is from God amd that this “apparition” is REALLY Mary? 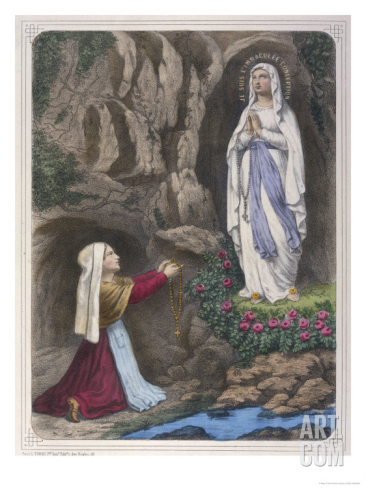 The Virgin Mary’s apparitions to St. Bernadette took place only four years after the Catholic Church’s infallible declaration of her Immaculate Conception by Pope Pius IX. There is no other person in the whole world except Jesus Christ Himself (and our first parents, Adam and Eve, who were born before the Fall) who have been conceived Immaculate – meaning without the stain of Original Sin. Mary, Mother of God, confirmed that she was the unknown “Lady” Bernadette was seeing by her very words “I am the Immaculate Conception”. Shadaan, your comment is full of flaws. I don’t think you learnt very much Catholic Teaching at that school you went to. Mary is Queen of Heaven, and helps us on our journey to God. Devotion to Mary is above all, devotion to Christ. Your statement that Jews believe animals have souls, is also not strictly true. Animals have a type of spirit (which is not the same as a soul), but they follow their instincts and do not have free will. They cannot chose between Good and Evil. Only human beings, created in God’s Image and Likeness, have that ability. Only humans have the capacity to communicate (pray) with their Creator, and that inbuilt desire and longing for unity with God. “How sure are you that this is from God…” asks Jane, which incidentally was the name of my first girlfriend: Catholics are not required to believe in the miracles of Lourdes, and those of other faith traditions (or none) cannot believe in them because they are matters of Catholic faith, not Presbyterianism (for example) or scientific empiricism. Non-Catholics just don’t get it and can’t. Personally, I have enormous respect for the experiential facts of Lourdes without being a firm believer in the literal ‘truth’ of St Bernadette’s visions. Other Catholics may beg to differ from my thoughts on this, which is okay, because we are all here to learn and/or teach. I agree with Kathleen that animals do not have souls. If they did, they would be subject to the Last Judgment, an absurd notion on its face. Animals can do a great deal of harm, but they cannot sin. The first fact about Lourdes is that it is’t Private! There was and is nothing Private about Lourdes. Lourdes isn’t Dogmatic either actually it is confirmation of the the Faith from its two sources. The Bible and Sacred Tradition. The Belief in the Dogmas of Immaculate Conception and the Assumption come from these two sources. Papal Dogma are also from these two sources. The importance of this is because the Faith is Revealed not Evolved. Lourdes is God’s Public intervention into the Last Times. We can be confident about this because this was the Public appearance of the Woman announced in Genesis and in the world of Modern science and the Marxist and Darwinian (we can add Adam Smith) satanic Evolution. This is Revelation opposing the Pride of rational intellect. Our Lords these are Our Lords words at Loudres (you cannot separate Jesus from Mary nor His Pope). Animals and Man. The Sin of Adam and Eve brought death into Creation. Man’s death is the death of His Soul. The death of the Body is not to be confused with the death of the Soul. Thank you for reminding us of that moving scene from the old 1943 film, “Song of Bernadette”. The film is good, but the book is far better, and I highly recommend it to anyone who is interested in Lourdes. It gives many insights into the real miracles* witnessed there ever since Our Lady first appeared. My parents had this book in their ‘library’ and I devoured it after my first visit to Lourdes as a teenager, and then re-read it some years ago. * There are numerous miraculous cures, dutifully scrutinised by teams of experts from all walks of life, believers and non-believers, that have taken place at Lourdes since Our Lady appeared there. However the greatest of all the ‘miracles’ that occur – and which are not included in any list – are the many people who are converted (or re-converted) to the Catholic Faith by the graces bestowed on them when they visit the sanctuary of Lourdes. The best 150 minutes I ever spent watching! Brother B, I don’t know how you could have possibly missed it over the years! You could even get it from video cassette libraries in the 70s and 80s. It won a lot of awards, but kathleen says the book is even better. St Bernadette was Baptised 9th January 1844 12 months to the day her parents married. Her parish Church was St Peters and when asked wha Our Lady looked like said “As regards the face and the clothes, she perfectly resembles the statue of the Virgin in the parish church. She is, however, surrounded by light and she is alive.” This small statue represents Our Lady of the Miraculous Medal. She was affected by the Plague in 1855. First apparition 11th February of the Thursday before Shrove Tuesday there were 18 in all. Her first communion was 12th June 1855. Kathleen correctly linked Loudres to the Miraculous Medal “Ô Marie, conçue sans péché, priez pour nous qui avons recours à vous (“O Mary, conceived without sin, pray for us who have recourse to thee”). Both St Bernadette and Saint Catherine Labouré bodies are Incorrupt. But what does conceived mean? At the moment of conception God creates the Soul. The conception is the dna of the parents coming together. But St Joachim and St Anne were born under Original Sin. What is more St Anne had other and later children (Mother of St John) whom were born under Original Sin. Much has been discussed above about animals , souls, spirits etc.. This wasn’t a problem for 1800 years in Christendom BUT today is a stumbling block. Here is the problem why did the Fall of Adam bring death to the animals and Creation. How was the dna of animals changed because of Adams Sin. The existence of animals and living organisms is expressly included in Genesis ad their naming by Adam. How was Original Sin passed onto animals? The Evolutionists off course have one way traffic and have no answer to this! Lourdes like Fatima challenge Mans choice of Revelation or Scientific reconstruction of Society , and dna. “After Mass and the Holy Hour, the group listened to Dr Adrian Treloar give a learned but fascinating account of some of the Lourdes miraculous cures from a medical perspective. For my own part, I was under the impression that I had a pretty good grasp of the extent of the cures but, when you see an x-ray on-screen, showing the result of a cancerous tumour on a pelvis, where any evidence of bone has been reduced to a poisonous mass and then compare it with an x-ray post Lourdes, that clearly shows a healthy pelvis that had not existed before going on pilgrimage, you gain a very profound concept of the full meaning of the word ‘cure’. And then Adrian showed a slide of the incorrupt body of St Bernadette, emphasizing that the saint has not been subject to any form of embalming treatment as in the cases of Lenin and Mao. There is also a beautiful picture of St. Bernadette’s incorrupt body on his article; it really does look as though she is just fast asleep. Because God created man in His image and likeness, men have eternal souls. When man dies, his soul is going somewhere for eternity. Unfortunately, when Fluffy dies, so does his soul. I am guessing that you are a protestant, and have some questions regarding Our Blessed Virgin Mary. If you understood that Mary is the Ark of the New Covenant, then you would understand why Catholics venerate her. Simply recall how the jews exonerated and venerated the ark of the covenant in the OT. If an individual didn’t show proper reverence while in the presence of the ark of the covenant in the OT, they were struck dead on the spot. If the Old Covenant is a mere ‘shadow’ of the New ,as St Paul tells us, how much more do we have to pay reverence to the new?!! Because Bernadette Soubirous was too young and uneducated to know what “I Am The Immaculate Conception” even meant… and because thousands have been healed by the waters at Lourdes. The devil doesn’t heal people, Jane. Ooh I am very appreciative. I AM THE IMMACULATE CONCEPTION – MARY MOTHER OF GOD.